It’s time to RESERVE YOUR BIRD! Secure one of our turkeys today for your Thanksgiving tradition. Don’t miss out on having one of our birds on your table. Why buy a turkey from White Oak Pastures? 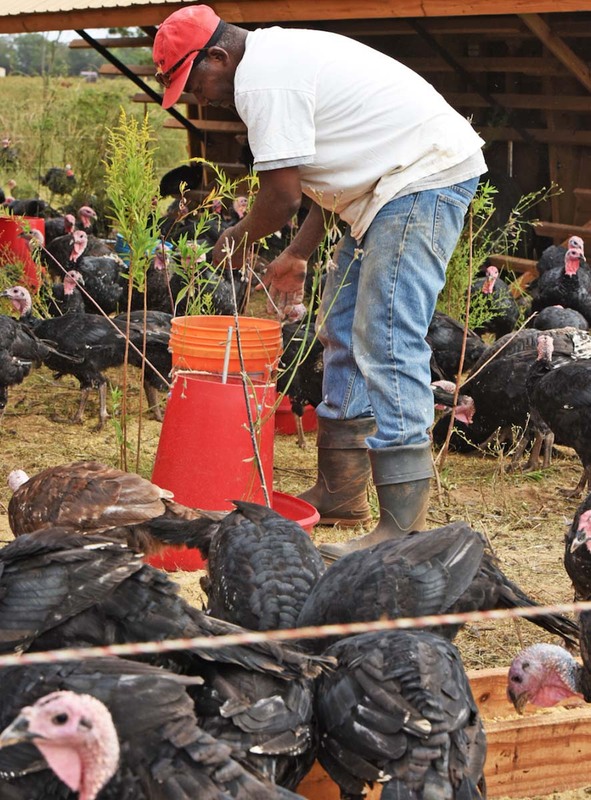 Our poultry production team takes tremendous efforts to safeguard our turkeys throughout their lives on pasture. In fact, one of our staff members travels to pick up the poults in West Virginia about twelve hours after hatch and transports them back to White Oak Pastures, where they are in a brooder about twelve hours later. In July, we received poults that we will raise for harvest in the holiday season this November and December. Passionate about animal welfare right from the start, we pick up the birds from the hatchery to ensure they are warm and comfortable in the brooder in less than 24 hours. Here at White Oak Pastures, we brood our turkeys in retrofitted carports. We most certainly have heaters installed in the brooders, but in the hot southwest Georgia summer, our challenge is to keep the birds from overheating. The temperature inside the carports can quickly rise into the low 100s, while the birds most desire the mid-90s. We have side panels that open up to allow for a cross-breeze, and vents at the top of the shelter to allow the hottest air to flow out. Before our birds are moved from the brooder to pasture, the mobile shade shelters are cleaned, and the grass is mowed low. Next, we deploy the fencing, feeders, and waterers! 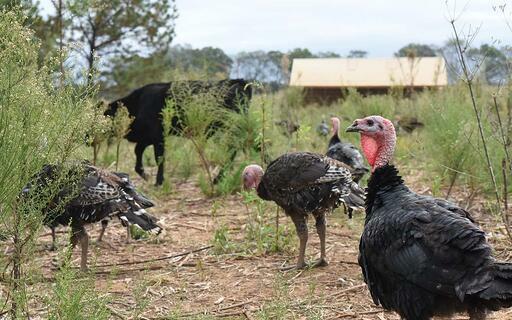 The pasture management strategy for our holiday turkeys is quite similar to our laying hens, ducks, and broilers. We place three retrofitted cotton module builders within four sections of 164' long and 4' high PoultryNet arranged in a square and charged using a battery powered 5 Joule Cyclops CHAMP unit. T-posts are placed at each corner to keep the fence taught. Feed and grit are kept on skids that are pulled with the shelters. Water is supplied via pipe to Plasson poultry drinkers or water troughs. Once per week, the shade shelters are moved to a new paddock. To accomplish this move, three sections of PoultryNet are erected on one side of the existing paddock to create a second square which shares a fence with the previous square. To move the housing to a new paddock, the section of fence separating the old and new paddock is removed. The housing is then pulled forward by a tractor into the new paddock. The birds are herded into the new paddock, and the fence separating the old and new paddocks is replaced. The fence charger is moved and the three sections of PoultryNet creating the previous paddock are taken down. This allows us to raise the birds in a more humane manner by being proactive with predator protection. We can also easily keep a livestock guardian dog inside the PoultryNet paddocks. All of the birds are notably more comfortable with the fencing, spending more time foraging and less time watching for threats. PoultryNet also allows us to control the animal impact on the pasture. We can prevent birds from returning to where they just were, and avoid any disease issues from them foraging in spilled, moldy feed. These previously visited plots quickly become the most nutrient dense parts of pasture due to the turkeys positive impact. Controlling this impact also allows us to definitively rest all areas of a pasture, other than the space inside the paddock. It takes great planning to raise birds in perfect timing for the Holidays, but we have been refining our model for almost a decade. Our turkeys have been a sell-out for many years, and we look forward continuing this farm tradition. 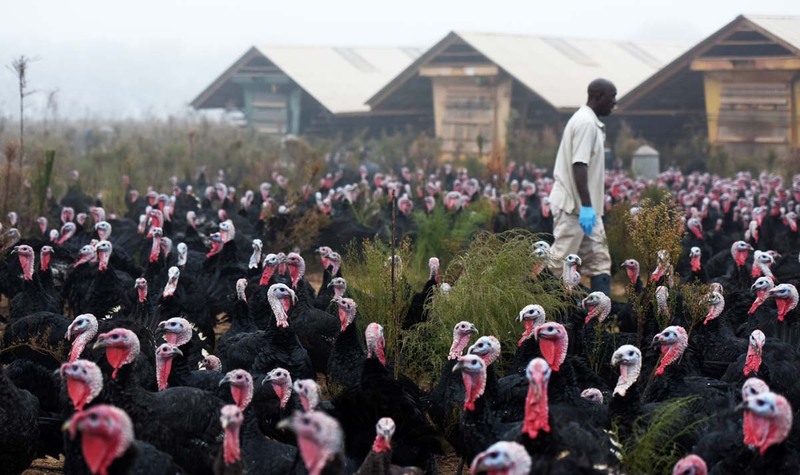 So, when deciding what to feed your family for Thanksgiving, we hope you will consider one of our holiday turkeys. Their taste is incomparable, and they play a distinctive role at White Oak Pastures by regenerating our soil. All turkeys will ship the week before Thanksgiving, 11/12/18, unless otherwise specified in the “comments” section of your order.